Construction workers broke bones "jumping off the 2nd and 3rd floor" as building went up in flames a Denver Fire spokesman said. 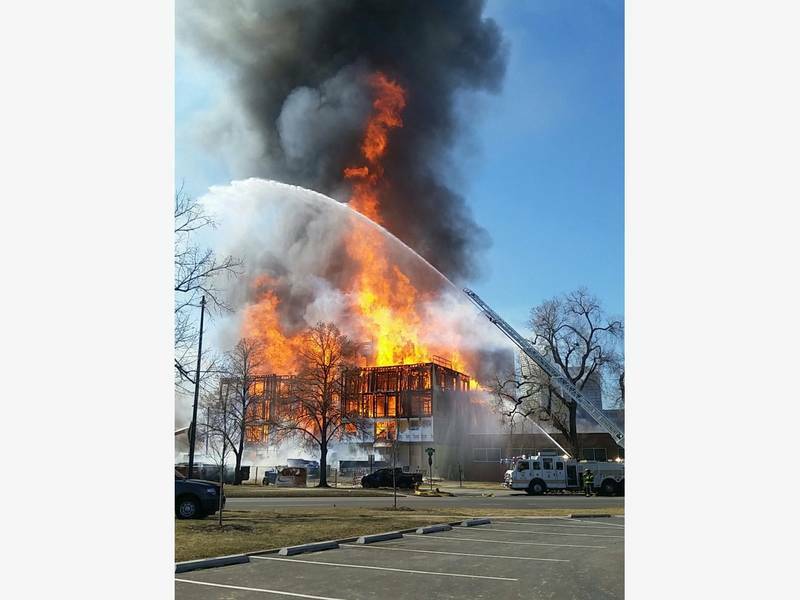 Two persons were still unaccounted for Wednesday in a mid-afternoon Denver construction site fire that completely destroyed an apartment building under construction. Construction workers were also injured "jumping off the second and third floors" and others were injured "trying to catch them." One firefighter was also being treated for minor burns, said Denver Fire Captain Greg Pixley. The blaze Pixley called "catastrophic and dangerous" set an adjacent building on fire, and floating embers ignited the rooftops of six other adjacent structures, Pixley said. Several construction vehicles and about 30 cars caught fire in the parking lot and three fire engines were damaged by the heat. Around 100 firefighters helped to fight the inferno. Construction workers who spoke to Pixley said they first saw the flames on the third floor around 12:09 p.m. The fire took about 120 minutes to become "under control." The building under construction was an apartment building at 1833 North Emerson. Pixley said the building under construction was susceptible to fire because of "exposed wood" which helped explain why the fire spread so quickly. "We had reports that a number of construction workers were leaping and jumping from the second floor," Pixley said. Some of those workers, and people on the ground "trying to catch them" suffered broken bones, and were being treated in local hospitals. One person was seriously injured in the fire and was rescued by firefighters, he said. The heat was so intense it could be felt about 300 feet away, and flames shot 200 feet into the air, Pixley said. Cars in the parking lot were damaged with melted windshields and peeled paint, Pixley said. The heat caused an adjacent medical building to the south to also catch fire, and patients were evacuated by firefighters and staff, he said. That fire was extinguished by firefighters. Four other buildings near the flaming structure were saved by preventative measures Pixley said. Denver Police had taken 100 statements from witnesses by 3 p.m., Pixley said. 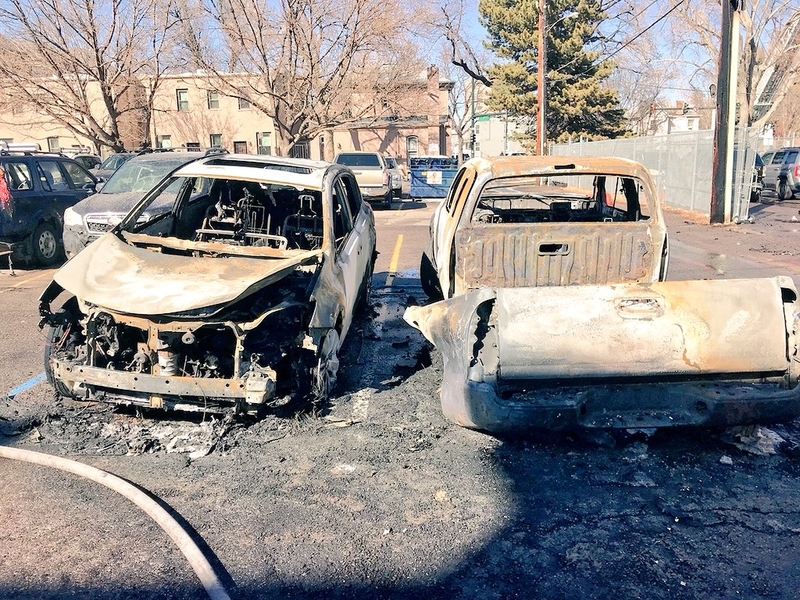 Anyone else who was at the scene and could help with information about the investigation was asked to call the fire investigation division at 720-337-2800. 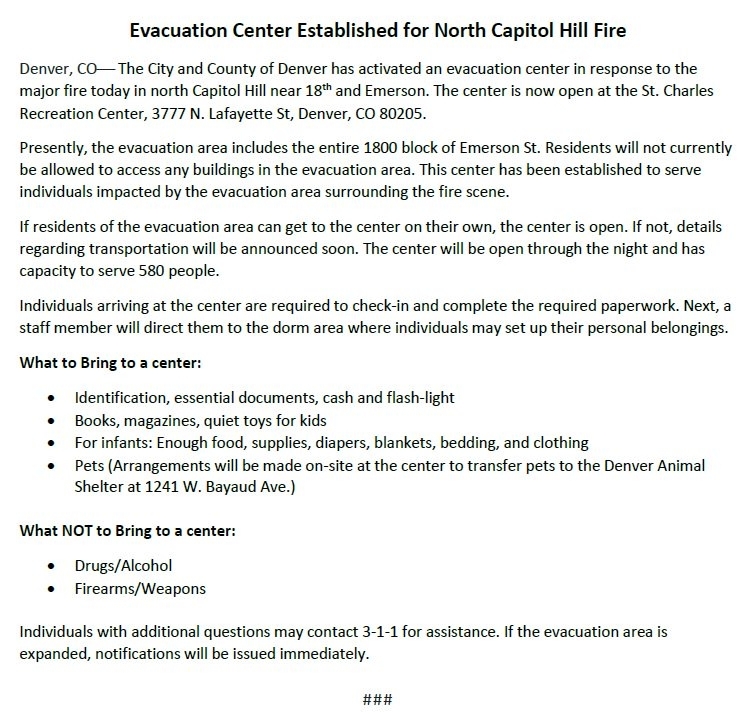 People evacuated from the 1800 block of Emerson Street were asked to gather in an evacuation center at the St. Charles Recreation Center, 3777 N. Lafayette St. The National Weather Service posted radar images of the size of the fire from weather satellite. This is a breaking story, please refresh for updates. Denver Fire provides update on 18th/Emerson Fire. Savings on Insurance Costs. Masonry provides the best fire resistance of any building material because it cannot burn, melt or bend. This fact is acknowledged by insurance companies and is reflected in the premiums for insurance on the building and its contents. The use of fire resistive building materials throughout provides maximum security for future business performance. Many businesses cannot survive the devastation of a fire and the interruption to their normal flow of goods and services.